Peligrosa, Austin’s premier Latin electronic music collective, has just teamed up with Houston-based collective Bombón to release what is absolutely one of the can’t-be-missed beat records from Texas this year. Now, electronic music collective is a term that probably brings up images of a council of brightly colored rave-outfit bedecked youths sitting about a table in their most regal of kandi jewelry and discussing molly-related group policies (No? Just me? ), but in Austin, that concept more often refers to the complex and eclectic crews of veteran electronic producers like Applied Pressure, Feedback Alliance and the legendary Peligrosa. Peligrosa has been a shining beacon of fun, smart beats in Austin since their birth back in ’07, and just this year they have taken their hard-won production and music-industry acumen to the next logical step by creating Discos Peligrosa, their very own label. 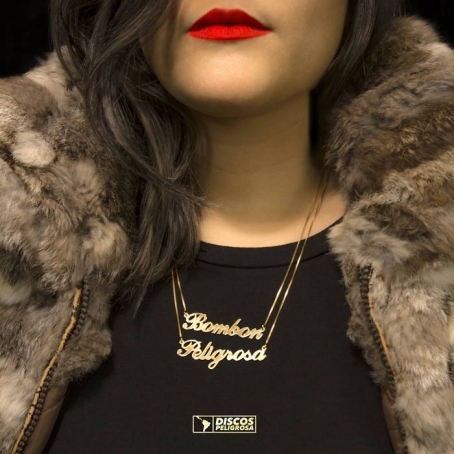 This record, a split aptly titled BOMBÓN X PELIGROSA, is one of the first releases by Discos Peligrosa as a new label, and it features Peligrosa and Latin robot soul mates Bombón taking turns dropping killer tracks one after the other for 7 stellar pieces of future Latin dance music. Both of these groups are all about taking the traditional sounds of Latin instrumentals and song structures (especially beats) and melding and exploding them from their original states into the newtech, future-leaning world. Both crews are on point in their efforts toward this highly commendable endeavor with BOMBÓN X PELIGROSA, which is exciting and dynamic from end to end and is actually scientifically impossible to avoid dancing to (Being Ultra Music Expert Geniuses, we know this to be a fact.). Get up on this thing below and blow your friends minds by dropping some of the most undeniably sick future dance music available in the world at yer next party instead of That Goddamned EDM again, and keep up with Peligrosa at their blog here, which is frequently updated and has some pretty damn decent writing if we do say so. Viva Peligrosa.